Cabinet appointed by the president and headed by the prime minister, who is the leader of the largest party in parliament. Note – the roles of the president and prime minister are not well defined at this juncture. Constitutionally, the president remains chief of state and head of government, but the prime minister is charged with coordinating government business. 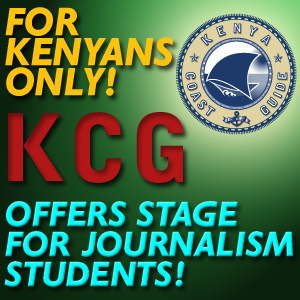 Kenya is a presidential representative democratic republic, whereby the President is both the head of state and head of government, and of a multi-party system. Executive power is exercised by the government. Legislative power is vested in both the government and the National Assembly. The Judiciary is independent of the executive and the legislature. There was growing concern especially during former president Daniel arap Moi’s tenure that the executive was increasingly meddling with the affairs of the judiciary. In December 2002, Kenyans held democratic and open elections, most of which were judged free and fair by international observers. The 2002 elections marked an important turning point in Kenya’s democratic evolution in that power was transferred peacefully from the Kenya African Union (KANU), which had ruled the country since independence to the National Rainbow Coalition (Narc), a coalition of political parties. The last general elections were held on 27 December 2007. In them, President Kibaki under the Party of National Unity ran for re-election against the main opposition party, the Orange Democratic Movement (ODM). The elections were seen to have been flawed with international observers saying that they were below international standards. After a split which would take a crucial 8% of the votes away from the ODM to the newly formed Orange Democratic Movement-Kenya (ODM-K)’s candidate, Kalonzo Musyoka, the race tightened between ODM candidate Raila Odinga and Kibaki. As the count came in to the Electoral Commission of Kenya (ECK) headquarters, Odinga was shown to have a slight, and then substantial lead as the results from his strongholds came in early. As the ECK continued to count the votes, Kibaki closed the gap and then overtook his opponent by a substantial margin after votes from his stronghold arrived later. This led to protests and open discrediting of the ECK for complicity and to Odinga declaring himself the “people’s president” and calling for a recount. The protests escalated into violence and destruction of property, almost 1,000 people were killed and nearly 600,000 displaced. The dispute caused underlying tensions over land and its distribution to re-erupt, as it had in the 1992 and 1997 elections. Hundreds of thousands were forced off their land to relatives elsewhere in the country and some claim weapons are being bought in the region, perhaps in anticipation of the 2012 elections. A group of eminent persons of Africa, led by former United Nations secretary-general Kofi Annan, brokered a peaceful solution to the political stalemate. This group enjoyed the backing of the UN, European Union, African Union and United States government, as well as those of various other notable countries across the world. More information is available in clashes in Kenya (2007–present). Annan requested mediation support for his team on the Panel Secretariat from the Swiss based conflict mediation organisation, the Centre for Humanitarian Dialogue. On 28 February 2008, Kibaki and Odinga signed an agreement on the formation of a coalition government in which Odinga would become Kenya’s second prime Minister. Under the deal, the president would appoint cabinet ministers from both PNU and ODM camps depending on each party’s strength in Parliament. The agreement stipulated that the cabinet would include a vice-president and two deputy Prime Ministers. After being debated and passed by Parliament, the coalition would hold until the end of the current Parliament or if either of the parties withdraws from the deal before then. The new office of the PM will have power and authority to co-ordinate and supervise the functions of the Government and will be occupied by an elected MP who will be the leader of the party or coalition with majority members in Parliament. The world watched Annan and his UN-backed panel and African Union chairman Jakaya Kikwete as they brought together the erstwhile rivals to the signing ceremony, beamed live on national TV from the steps of Nairobi’s Harambee House. On 29 February 2008, representatives of PNU and ODM began working on the finer details of the power-sharing agreement. Kenyan lawmakers unanimously approved a power-sharing deal 18 March 2008, aimed at salvaging a country usually seen as one of the most stable and prosperous in Africa. The deal brought Kibaki’s PNU and Odinga’s ODM together and heralded the formation of the grand coalition, in which the two political parties would share power equally. A constitutional change was considered that would eliminate the position of Prime Minister and simultaneously reduce the powers of the President. A referendum to vote on the proposed constitution was held on 4 August 2010, and the new constitution passed by a wide margin. Among other things, the new constitution delegates more power to local governments and gives Kenyans a bill of rights. It was promulgated on 27 August 2010 at a euphoric ceremony in Nairobi’s Uhuru Park, accompanied by a 21-gun salute. The event was graced by a number of African leaders and praised by the international community. As of that day the new constitution, heralding the Second Republic, came into force. The vast majority of Kenyans are Christian with 45% regarding themselves as Protestant and 33% as Roman Catholic. Sizeable minorities of other faiths do exist. There is a fairly large Hindu population in Kenya (around 500,000), who have integrated well with the community and play a key role in Kenya’s economy. (Muslim 10%, indigenous beliefs 10%) but estimates for the percentage of the population that adheres to Islam or indigenous beliefs vary widely. Sixty percent of the Muslim population lives in Coast Province, comprising 50 percent of the total population there. Western areas of Coast Province are mostly Christian. 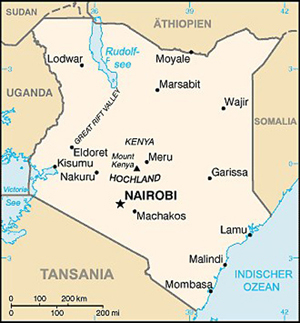 The upper part of Eastern Province is home to 10 percent of the country’s Muslims, where they are the majority religious group and apart from a small ethnic Somali population in Nairobi, the rest of the country is largely Christian. There is a minority group of Baha’is. There are 3-5 births per woman on average. Life expectancy is estimated at between 47 and 55 years. There is a large number of HIV-positive people in Kenya. Maternal mortality is high, partly due to female genital mutilation.